This post is the result of hours and hours of me trying to write some code but never getting it quite right. I think that one of the worst things that you can do to yourself is to be scared to admit that you are struggling because you will end up never trying anything new. That is why I am publishing what I have got so far despite not being very happy with it. (I also think maybe someone reading this will be able to tell me what I am doing wrong). 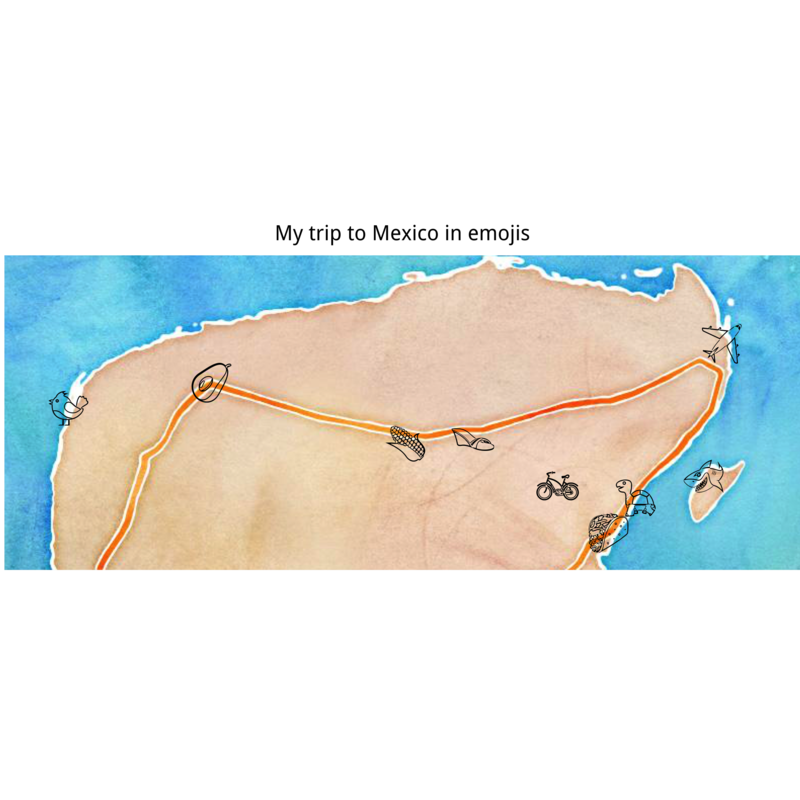 UPDATE: I finally have my emoji map! I also want to celebrate the things that I did work. I did figure out how to include gifs and emojis in the text! I picked a gif that illustrates what this jetlagged person probably should have done a long time ago 😄. The other day someone asked for some help to make a map and I suggested using R and ggmap. I wanted to share some code and decided to turn it into a blog post. I just got back from a two week holiday in Mexico. Everywhere we went was so beautiful and everyone was so nice to us (shout out to the people who helped us get more fuel when we were running dangerously low). To remember my lovely holiday I will plot all the places I went to. The next step is to create a list of all the places I went to. I use geocode from ggmap to get the coordinates. It is always worth looking at your data and as you can see from the min and max of the longitudes and latitudes, all places are close to each other. The first time I ran the geocode command it picked Valladolid in Spain instead of Mexico so it didn’t actually appear on the map when I plotted it. I fixed this by adding “Mexico” to the search string. Ironically I accidentally booked a hotel in Valladolid in Spain instead of Valladolid in Mexico for my holiday and only realised the day before I was going. My attempt to include the .png file. I feel like this should be fairly straighforward but despite trying trying a few different ways (I deleted some code) it just doesn’t work.